I had the great pleasure and opportunity to ask artist, John Craig Freeman, a few questions regarding his art practice and work. Below, you will find some wonderful answers that include his perspective on the trajectory of public art and art as intervention. In addition, Freeman will be doing an artist talk at the SOMArts Cultural Center Thursday, March 29th! Lastly, there are spots left if you are still interested in taking his Augmented Reality Workshop this weekend. Please click here for more information. Dorothy Santos (DS): What was the impetus for you intermingling virtual art objects as interventions into physical space? Is there even room for translation to occur? Cognitively, I find it fascinating the way visual information is processed and what occurs when the two (virtual interventions and physical objects) are mixed versus an actual translation (i.e., virtual to physical, physical to virtual). John Craig Freeman (JCF): My interest in public art as intervention precedes augmented reality technology by more than two decades. In 1990, I created “Operation Greenrun II,” which consisted of eleven 10′ X 40′ bitmap images on billboards along Highway 93 at the Rocky Flats nuclear weapons plant in Colorado. This project demonstrates an early interest in emergent technology as art practice and public art as intervention. Intervention in in both institutions of high culture and intervention in government policy and the institutions of the nation state. Think of the media as a kind of virtual reality, which of course it is, that can be intervened in. The decision to shutdown Rocky Flats was made in 1991, during the media firestorm this project was created, proving that art does have a role to play in tangible political change. Whereas the public square was once the quintessential place to air grievances, display solidarity, express difference, celebrate similarity, remember, mourn, and reinforce shared values of right and wrong, it is no longer the only anchor for interactions in the public realm. 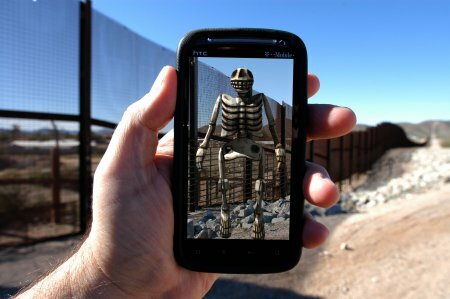 That geography has been relocated to a novel terrain, one that encourages exploration of mobile location based monuments, and virtual memorials. Moreover, public space is now truly open, as artworks can be placed anywhere in the world, without prior permission from government or private authorities – with profound implications for art in the public sphere and the discourse that surrounds it. In the early 1990s, we witnessed the migration of the public sphere from the physical realm, the town square, to the virtual realm – the Internet. In effect, the location of public discourse and the site of national identity formation has been extended into the virtual world. Augmented reality folds the distributed, placeless network back upon location and brings it crashing back down to place. Using emergent technologies, including augmented reality, to produce large-scale public work at sites where the forces of globalization are impacting the lives of individuals in local communities, my work seeks to expand the notion of public by exploring how digital networked technology is transforming our sense of place. Much of my work is located in contested places such as borders and ports. I like to explore, and make evident, the edges, if you like. The metaphor of liminal space can also be applied to the boundary between the physical and the virtual. Augmented reality makes this boundary porous, allowing the digital network to spill into the physical. DS: This issue has been brought up several times in my writings, blog posts, and general conversation about new media and digital arts. I’m curious of your perspective. How do you envision people with very little or no accessibility to technology (i.e., no smartphone or android) to engage in the discourse of Augmented Reality? JCF: I have had to contend with this question as well, most recently during a talk I gave at the College Art Association conference. I have to say that the concern over this issue puzzles me in regard to both art and technology. To begin with, art has always been an elitist proposition. Even if people can afford the price of admission to the museum, conceptual access to the meaning of art and its value is carefully controlled by taste-makers and marketers. Incidentally, the Rocky Flats work was a response to the art world’s mission of social class reinforcement. Further, the ubiquity of cell phone technology is our best chance at the collapse of the digital divide. From the favelas of São Paulo to the shantytowns of Kinshasa, cell phones are becoming the rule rather than the exception. It is just a matter of time before these devices will all be internet ready. Less than a decade ago, it would cost tens of thousands of dollars to create a cave environment for viewing virtual reality. Augmented reality is virtual reality in your pocket. DS: Typically, imagination conjures images from a story or a narrative. What role does the imagination play in Augmented Reality when the images are created and inserted into our visual perception? JCF: The most profound example I can offer was from my experiences documenting to Border Memorial project in Southern Arizona last January. Each one of the data points represents a very specific location where human remains were recovered. Accordingly, each place I visited represented a very real and tragic story of how an individual person died trying to cross the desert in search of work and a better life. Although I was careful to strip individual names from the data, prior to the project being deployed, the scene was often rich with details. These details, both large and small, evidence of a campfire; fragments of clothes; empty water bottles, as well as the topology of the landscape, a sandy wash indicating the most likely route over the pass on the mountain just beyond, painted a sobering picture. DS: Lastly, other than a formal intervention, how do you see Augmented Reality making an impact amongst traditional art institutions and patrons? More and more individuals are learning about the impact of new media and digital arts but there still seems to be a very specific following and engagement from the art community. JCF: ManifestAR, the international artists’ collective with which I often work, formed after the groundbreaking uninvited augmented reality intervention at the MoMA in autumn of 2010. It is now the artist, not the curator, who decides which artworks can be placed where. The group sees this medium as a way of transforming public space and institutions, by responding to and overlaying the configuration of located physical meaning. Utilizing this technology as art is a new proposition that explores all that we know and experience as the mixture the real and the hyper-real. Art world power structures, the nature of art exhibitions and discourse, are all called into question, even the border between art and life itself. John Craig Freeman is a public artist with over twenty years of experience using emergent technologies to produce large-scale public works at sites where the forces of globalization are impacting the lives of individuals in local communities. John is currently an Associate Professor of New Media at Emerson College (Boston) in the Department of Visual and Media Arts and a Visiting Scholar at the Center for Research in Computing and the Arts at UC San Diego. Learn how to place digital 3D objects in real physical space (virtually) forever. Augments can be created in any scale for any location in the world and viewed through the camera and screen of mobile devices. This workshop provides a hands-on and in-depth introduction to AR for participants to make giant artworks, public interventions and personal or historical memorials. This is a beginner to advanced workshop. No previous programming or design experience is required. All participants in John’s workshop will have their finished digital augment and a 17″ x 22″ color print automatically added to the current SOMArts exhibition “I Am Crime: Art On the Edge of Law“. 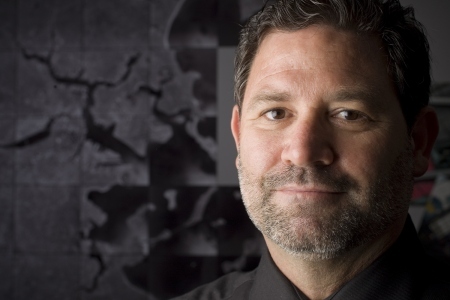 John Craig Freeman is a public artist with over twenty years of experience using emergent technologies to produce large-scale public works at sites where the forces of globalization are impacting the lives of individuals in local communities. John is currently an Associate Professor of New Media, at Emerson College (Boston) in the Department of Visual and Media Arts and a Visiting Scholar at the Center for Research in Computing and the Arts, at UC San Diego. Arts Blogger Challenge | Where is the Cultural Capital of America? New York has long been considered the cultural capital of America. Is it still? If not, where? The San Francisco Bay Area can easily serve as a contender. Its moniker as the Golden State takes on an entirely different meaning when it comes to both monetary and cultural capital. But New York City boasts of a million more opportunities for those interested in corporate life or a fruitful creative existence. The long withstanding tribal aspect of the New York City art community is, virtually and literally, incomparable. Quite honestly, I don’t believe a culture capital exists in America. Period. Globalization eradicates this concept of one physical place serving as the lone beacon for cultural sustenance. Being a San Francisco native, I was almost fooled into thinking and arguing the point that my home state and city would be the newest place for culture consumption. Then, I started to realize something, much of what we collectively do occurs on screens and mobile devices. Silicon Valley is a great example of this. The name alone refers to physical stretch of the Bay Area landscape where innovation occurs but it’s only a name, a signifier. Bottom line: The cultural capital of America is not a physical place. It is a virtual place where people take part and realize ideas at the intersections of arts and technology and social media, which occur all over the world. From forums to blogs to open source systems such as Processing, one of the clear manifestations of arts and technology occurs through a constant exchange of programming language on a global scale. Recently, The Creators Project organized an arts and technology festival in San Francisco showcasing the work of artist-technologists based in the Bay Area. The highlight of the weekend was sitting in on artist talk and drawing workshop led by UCLA professor Casey Reas, co-creator of Processing. His talk included a brief history of artists that, similarly to Reas, took language and created art through innovation and unorthodox methods. The drawing workshop was especially eye-opening. The exercises included a set of instructions that asked the participants to draw what they read (totally reminded me of Sol LeWitt whom Reas mentioned during his artist talk AND John Balderssari’s teaching methods). The hybrid artist-technologist innovates and affects change at a rapid rate. With open source programming playing an integral role into the way people are using tools of technology for function, critical thinking, and art creation, virtual spaces like github and Processing forums serve as the new cultural capitals. If arts and technology serves as the intersection of a culture capital, social media is the seemingly colossal skyscraper where rapid information exchange occurs. Twitter, tumblr, Facebook, Google+, and the like all allow for copious information and data consumption. It is where we find out about our world (whether we like it or not). People are more likely to find out about a high magnitude earthquake (or a friend’s bagel preferences) than on syndicated news channels and sites. Social media culls, most if not, all the information that interests us. The need to know has quite the narcotic effect. Nevertheless, it’s one of the, if not the primary, ways we stay connected. Again, there is no one place where a cultural capital exists. Although places like New York and San Francisco captivate the minds and hearts of many business folks, entrepreneurs, and creative types, it becomes clear that the existence of a physical culture capital is diminishing with our lives driven so heavily by what we witness on screens and what is, literally, at our fingertips. Please visit the 2012 Great Arts Blogger Challenge and vote for ‘Dorothy Santos’ here. The website for Take One: A Gifting Performance by Tim Roseborough is live. Please explore Roseborough’s site and share your thoughts about his logographic system. It was an honor to have my Shotgun Review featured in Art Practical’s, Best of Year Two, issue. You can read more here. Please forgive the poor quality of the photo above. Took it with my phone and it’s a bit dark. I will be posting more on The Creators Project (I actually took my fancy pants camera and will be downloading more photos). For now, I wanted to share my favorite experience at The Creators Project – Casey Reas! This past year, I’ve tried to commit to learning Processing and the basics (we’re talking absolute basics of Java Script via Code Year). In earlier posts, I’ve expressed the desire to learn programming because it provides me with insight on the artist-technologist’s creative process and the problem solving they must work through. Reading through the book, Form + Code: In Design, Art, and Architecture, has been informative on the use of creative coding to create visual and interactive art works. Over the weekend, I made my way to Fort Mason for The Creators Project (CP). Walking up to Casey Reas and introducing myself to him before his artist talk and drawing workshop was, by far, the best part of The CP weekend. I’m trying to imagine a Justin Bieber fan. Whatever emotions they might feel, that’s probably how I felt when I met Mr. Rheas (minus the crying and screaming). Yes, I’m a huge fan and the fact that this particular art hero is a sweet guy – total icing on the cake. Information Gathering (Minus the Heavy Encyclopedias) ~ How do you research and gather information? Brooklyn based Creatives, m ss ng p eces, created a video (for Percolate) asking some of the top information gatherers or content curators what curation looks like in our highly globalized and heavily virtual, interactive, internet based world. It’s definitely important for someone like me who wants to hone my writing, physical/virtual curatorial skills, and overall ability to research.